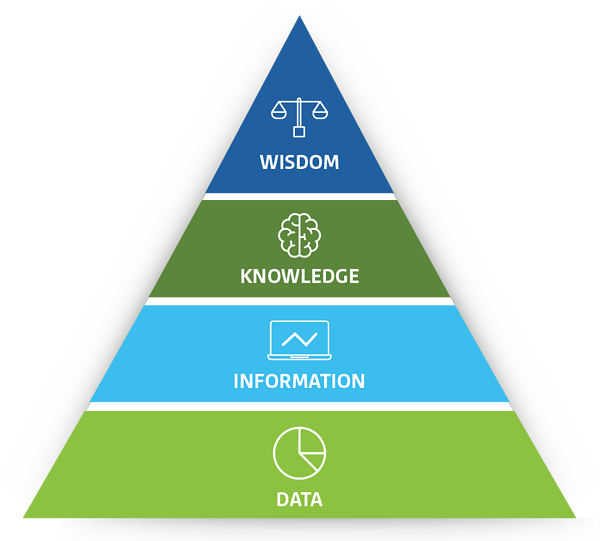 To boil it down, the DIKW pyramid represents a hierarchy of decision-making that healthcare leaders interested in data analytics can follow to understand how they can capitalize on their resources and make more informed decisions. At the foundation of the pyramid is data, it’s what everything else is built upon. The healthcare space is flooded with various types of data: state, Medicare, all-payer claims, EMR, demographic, psychographic, and so on. Making sense of this data is necessary in order to drive strategic growth decisions, but it can be a “catch 22” because understanding, cleaning, and updating this data is difficult to do and requires a tremendous amount of focused, dedicated energy. It’s also critical to make sure you are asking the right questions of the right data, a prevalent issue that often goes unaddressed. But if using the wrong data to answer a growth question, you may miss important segments of your population in your analysis and risk using out-of-date or inconsistent data. Information sits on top of the data foundation and is attained by providing context to data. Information is data that has been queried via an analytics platform or deciphered by an analytics team which begins to give the data meaning and purpose. An example of this is when data has been uploaded into our analytics platform in its rawest form, and is then processed, or arranged into charts and graphs to become more meaningful. At this point, it’s information that has not yet been acted upon nor applied. Knowledge exists above information in the DIKW pyramid and represents the synthesis of multiple sources of information over time. Knowledge often comes in the form of frameworks, theories, and potential solutions for the problems or decisions at hand. Wisdom is the ideal state and exists at the top of the pyramid. Ultimately, wisdom is a state of awareness. It’s a paradigm or set of principles by which a person, or in our case a hospital, will act. Wisdom brings everything together and is the most important state of understanding because it is where higher-level thinking takes place. At this level, the decision maker should be able to teach or explain to others what is happening and why it’s happening. Hospital marketers and strategists often get caught in the weeds of data, spending the majority of their time at the bottom of this pyramid, interpreting, cleaning, updating, trying to make sense of their data. This leaves minimal time for higher, more strategic thinking—time spent in the knowledge and wisdom space where the best decisions are made. If the top of the pyramid is where leaders need to live, then something must be done to break the cycle of spending too much time at the bottom of the pyramid making sense of their data. This is where Stratasan can help. Stratasan exists to help hospitals and healthcare systems make more informed decisions and drive strategic growth. The DIKW pyramid explains our approach to these objectives. We believe that with the help of our technology and professional services, healthcare leaders will be able to move beyond the mess of healthcare data and into a place of informed, data-based decision making. We believe that our customers are the true market experts, and as such, they're the only ones that have the wisdom to make the right strategic decisions for their market, they just need to be empowered to do so. Our goal is to give lost time back to marketers, strategic planners, business development teams and allow for better strategic decisions to be made at a faster pace, with more meaningful results. For more information on how Stratasan can help you move up the DIKW pyramid and empower you to improve your growth strategy, schedule a discovery call with one of our experts today.